Yesterday was a landmark day for Markenfield, in that we held a planning meeting to discuss the forthcoming Caroline Norton Exhibition – scheduled to run during our 30 Open Afternoons this spring and summer. The Hall has never held a true exhibition – containing original documents – before, and the excitement was palpable. 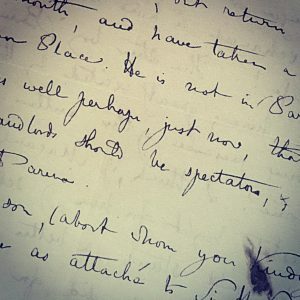 The Friends of Markenfield’s Archive & Research Group has been hard at work this winter sorting and transcribing the Caroline Norton papers that are… to continue reading click HERE to go to the Archive & Research Group’s Blog.